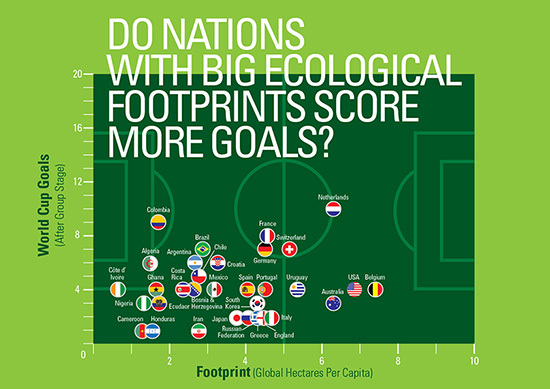 As the final World Cup match quickly approaches, we couldn’t help but kick around some Ecological Footprint numbers describing the diverse nations competing in this year’s games. 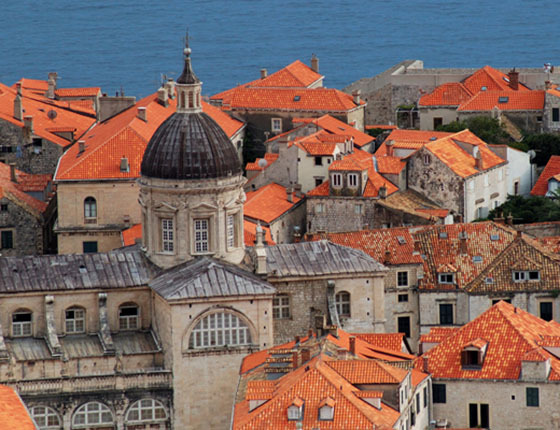 The eight nations who made it to the quarter-finals represent vastly different lifestyles. If all people on Earth lived like residents of those countries, how many Earths would it take? If we all lived like the Argentineans, it would take us 1.6 Earths. In contrast, living like the Belgians would require us to juggle 4.3 planets—not a small feat. The Colombian lifestyle would lead us to juggle the fewest Earths – just slightly more than one. Do Big Footprints Give Teams a Leg Up in Football? 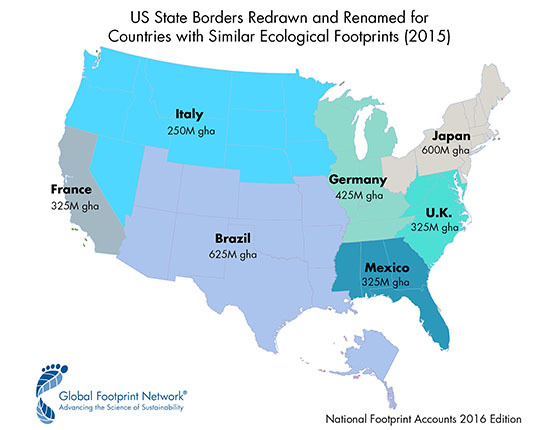 The U.S. and Belgium, for instance, have the largest Footprints per person, but their teams racked up only four goals – the same as the country with the lowest Footprint, Côte d’Ivoire. And the two countries that nailed the most goals have vastly different Footprints: Colombia, with 9 goals, has a Footprint of less than 2 global hectares per person, while the Netherlands with 10 goals has a Footprint of more than 6 global hectares per person. 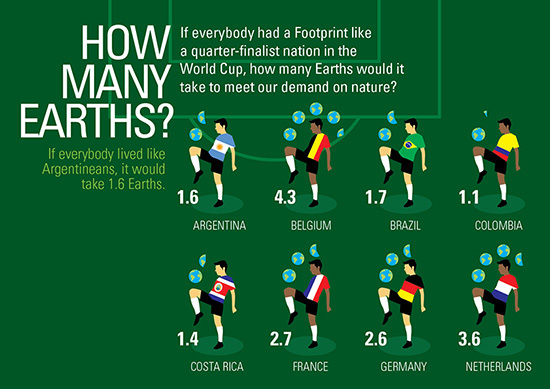 World Cup football is exciting—nearly as exciting as the global sustainability game. The rules are similar. In both, the players strive to play their best within a given field. For soccer, the field is roughly 1 hectare for 22 players. 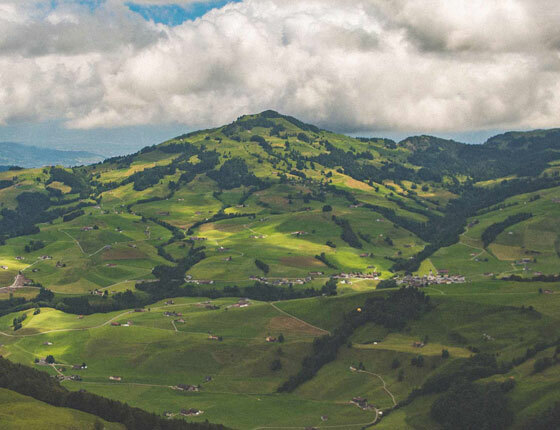 For sustainability we have about 1.7 global hectares for each citizen of the planet. Can we all live well within that field? Imagine the cheers if we can! The Colombians are closer to winning that game than the Belgians. And if the Germans played the U.S. team in terms of energy transition, it may look as ugly for the U.S. as it did for the Brazilians on the soccer field earlier this week. If we had to choose our favorite of the two finalists who face off on Sunday based on how little demand they place on nature, we would have to root for Argentina over Germany. GOOOOOLLLLLL! Curious about the Footprints of individual countries? Visit this page and select a country from the dropdown menu: http://footprintnetwork.org/cms/wp-admin/post.php?post=23&action=edit&lang=en.